The 800 people living near Gorleben and several thousand others living in a cluster of villages and small towns in the picturesque farming and forestry area have fought the nuclear plans and the transportation of waste to the storage from the beginning. The recycled waste from German power stations comes from a plutonium plant in northern France in so-called Castor caskets. 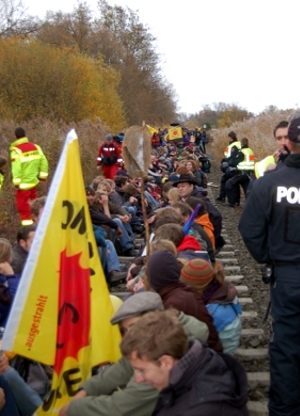 We have filmed the protests against the tenth such transport to Gorleben in November 2006. You will see how after 30 years the people living near Gorleben and the thousands who join them from all over Germany once a year when the Castor train comes are not tired of revolting against this nuclear madness. With many interviews, action images and snapshots, this documentary gives a multi-faceted impression of the unrelenting resistance against the nuclear facilities in Gorleben. 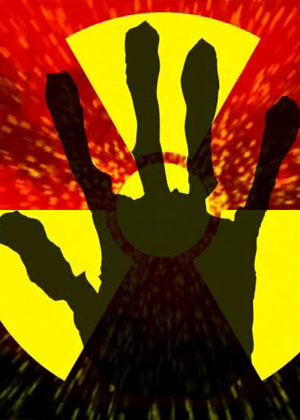 The promised German nuclear phase-out seems to be becoming a complete farce. The nuclear industry is mounting pressure on the government to let it build more nuclear power plants by touting them as climate savers. The struggle in Gorleben is seen by main stream media and politicians only as a policing problem. In that context the film gives voice and image to the protest’s view. The film deals with people who sit down on railway tracks and roads, usually in bitter cold, sometimes brutalised by police. It asks them where they find the courage and the motivation to resist again and again, but also about their fear and their powerlessness when facing an army of up to 20,000 police and the annual militarisation of a whole region. But resistance doesn’t need to be as serious as the issue. The first-time appearance of the insurgent clandestine rebel clown army provides a new spontaneous creativity and subversivity within the conflict. - Original German sound track with English, French, Spanish and Italian subtitles.